Taken by my husband, Joshua, while cheese shopping this Chanukah at the Machaneh Yehuda market. 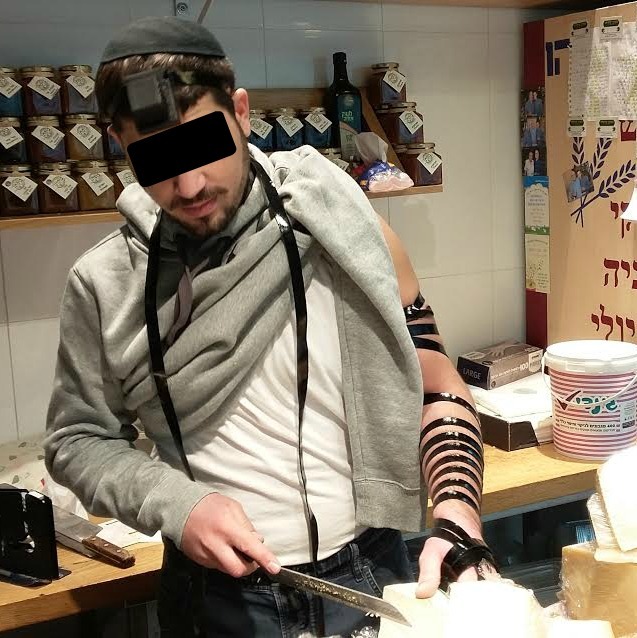 Is it unusual to see tefillin worn at work? yes, men usually only wear it in synagogue. Thank you for your reply. I know nothing of these things. I want to thank Joshua for taking this picture though. It is now stuck in my mind. “these words” . . . we are to teach them to our children and talk of them in the house, or when out and about . . . when we lie down, and when we awake. We are to bind “these words” as a sign, on our hand – and as frontlets between our eyes. I see the Jewish mom . . . thinking, speaking, praying “these words” as she cleans the home, as she bakes the bread, as she cares for her children. Not just in the holy place, but also in her sacred home – just like the cheese man. (Quote taken from Emunah with Love and Chicken Soup by Sara Yoheved Rigler.) Pray all day long, even when you’re slicing cheese!